Trellising Tomatoes: Crop Support Netting that substitutes raffia, cages or stakes. 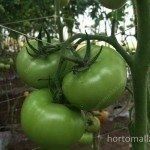 Trellising Tomatoes with HORTOMALLAS, improves harvests. 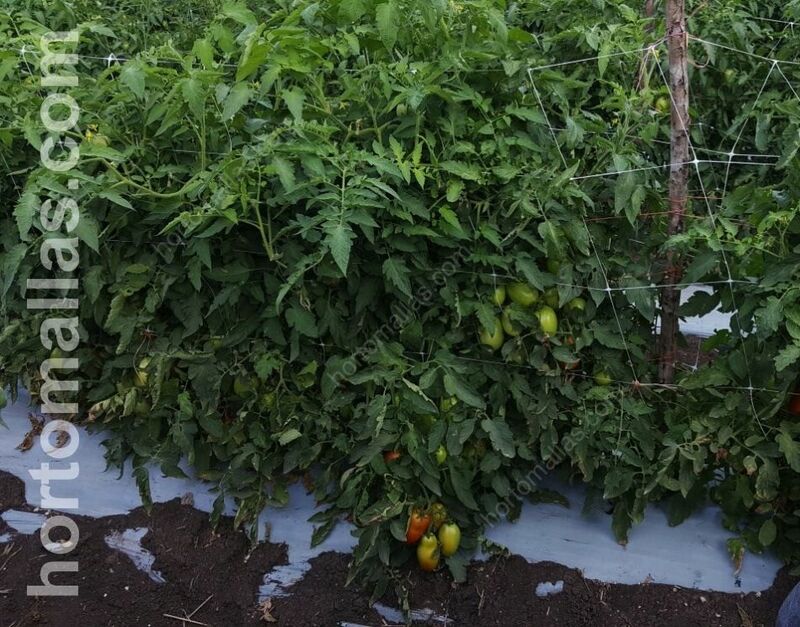 Like all the solanaceae cultivated for human consumption, trellising tomatoes with tutoring net (tomato net) is essential to a successful harvest. Having a good trellis netting system in place will ensure that the crop does not fall to the ground, where –discarding the damage that might be done by being stepped on by laborers– the plant would be in contact with the moist soil, increasing the possibility that they will be infected by some pathogen related to excess moisture. Unlike the horticulture raffia systems that choke the peduncle of tomato clusters, HORTOMALLAS trellis nets can actually support the weight of the tomato. 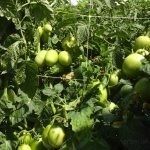 Supporting tomato crops with HORTOMALLAS netting will give you a faster recovery on your investment in comparison to a raffia system. This is accomplished not only through a reduction in the amount of labor needed to grow your crops, but also with a reduced quantity of disease spread. This happens because the hands and tools of laborers are one of the vectors for the transmission of various diseases that affect crops, any steps taken to reduce these risks are beneficial. 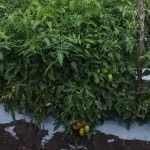 Tomatoes with netting: HORTOMALLAS becomes the best ally when it comes to yields and disease prevention on horticulture crops. 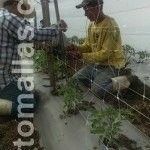 HORTOMALLAS recommends using your vegetable support netting in a double wall or V system to “press” the tomato plant between two trellis support nets and avoid unnecessary handling by the laborers. With this system of trellis netting you allow the tomato plant to grow naturally without the need to guide it. 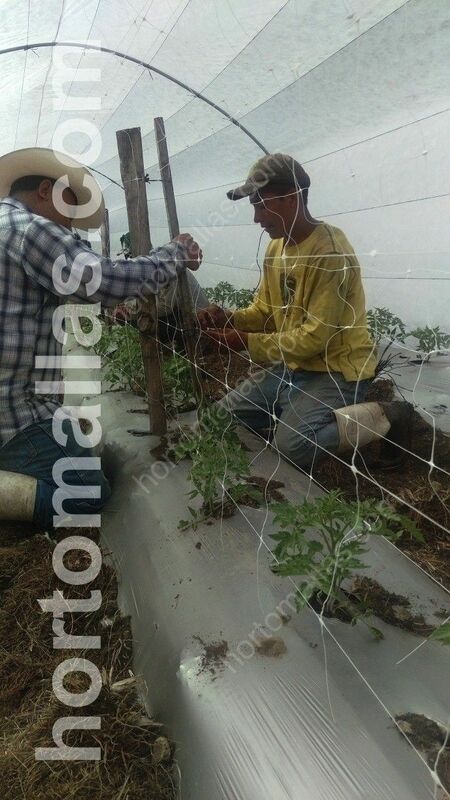 The branches will grow around the tomato support netting and leave the weight of the plant leaden with fruit to hang on the horizontal strands of the HORTOMALLAS squares, in effect taking advantage of the nature of the plant to maximize its solar exposure in each leaf. HORTOMALLAS netting increases crop yields. Trellising tomatoes on both sides of the furrow is essential in order to reduce mechanically transmitted diseases and plant stress. Tomato trellis is an important element to consider to increase the production of tomatoes (but it also works with other vegetables such as cucumbers, peppers, melons, beans or peas). 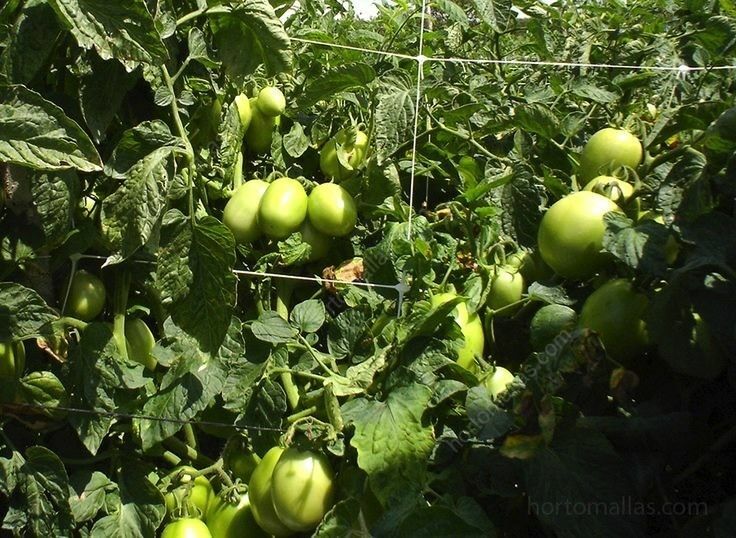 Using the HORTOMALLAS net you will reduce of mechanical plant stress thanks to fact that trellising with tomato netting instead of using traditional agricultural raffia one reduces the down time the plant will experience after manual operations. Trellising with a net allows the tomato vine to lean on the horizontal strands of the meshes naturally, as the new shoots grow and become weighted down by bunches of tomatoes. By reducing the typical abrasion of raffia twine during tutoring (or at the time of pruning) you not only reduce the risk of contagion by pathogens, but you also reduce the mechanical stress on the crops and prevents stock or leaf damage to the plant, as these bruises or cuts can become entry points for bacteria, fungi or other pathogens. This tutoring method increases the productivity of the crop since manual plant tutoring actions and handling of the plant provokes a negative reaction from the plant as it that halts its fruit weight production after the rearrangement of its leaves. The effects of mechanically induced stress from the forced change in leaf position during tutoring by hand will require the plant between 3 and 4 days to recover from stress produced with the contact from the hand that changed its orientation towards the sun. These days of normal tomato plant productivity losses add up to around 8-10% of the total production during a harvest cycle. When one considers that a tomato field can produce many tons per crop, just do the math to realize how much mechanical stress is costing you in terms of economical losses.